Negative topics are never fun, unfortunately there are a few things that tourists need to be aware of before coming to Spain to ensure a fun and stress-free vacation. Pickpockets are rampant in Madrid and Barcelona. Here are 8 tips on how to avoid becoming victim to pickpockets. When you are visiting Spain you will want to keep in touch with your family and friends back home. Here are some tips on how to get a SIM card in Spain. Spain may be one country, but there are different cultures and languages within the country. Come along and find out why. Visitors often hit the "big three" museums in Madrid: Prado, Thyssen and the Reina Sofia. However, there are many other museums in Madrid worth visiting—one such is the Lázaro Galdiano museum. You can take self-guided tours or official museum tours to get a peek into the life of José Lázaro Galdiano and his wife Paula Florido. There is never a shortage of things to do or see in Madrid, but if you can take advantage of exhibitions that are free—so much the better. Madrid has no shortage of cultural events and exhibitions throughout the year. This exhibition showcases the complete career of Lyonel Feininger who was a key figure on the avant-garde scene. Harry Houdini is one of the most famous illusionists of all time. This exhibition traces the history of modern magic and its evolution. Photographers Isabel Munoz and Choncha Casajus present the struggle of Congolese women against the use of sexual violence as a weapon of war. This exposition called Con los ojos bien abiertos, cien anos de fotografia Lecia (Eyes wide open! 100 years of Leica photography) is a tribute to the invention of the Leica camera. Artists such as Cartier Bresson, Paul Wolff, Bruce Davidson, Capa and Robert Frank are displayed. A tribute to Encarnacion Aragoneses de Urquijo (1886-1952), better known as Elena Fortun, who was an author of —primarily—literature for children and young adults. This exhibition demonstrates the existence of a European cultural network in the interwar period throughout Europe. Wouldn't it be wonderful to have a personal guide to show you all the hidden corners when you come to Spain the first time? I asked a few fellow bloggers to let me in on where they take family and friends who are visiting Spain for the first time. Find out where these locals take guests in Granada, Madrid and Seville. Madrid’s Mayor Manuela Carmena is serious about going green. She wants to see the city centre be pedestrianized by the time she leaves office in 2019. Many streets in the downtown core of Madrid are already open to pedestrians only. Already the downtown core has opened up many streets to pedestrians. Streets in and around Gran Via and Sol have banned cars. This is a positive move both for the environment and tourists. Carmena is proposing to close off the entire Gran Via to cars, leaving access to pedestrians, taxis and buses only. Read the full story in businessinsider.com. Are you looking for a souvenir of your travels, but don't want to take home a cheesy figure of a flamenco dancer? 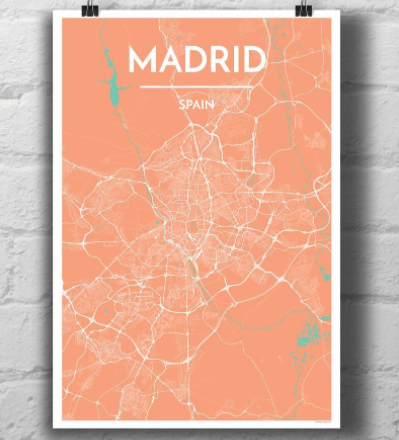 Point two maps sell map posters that will remind you of your trip. Point two maps can be ordered from their web. What is your favourite souvenir from your trip to Spain? If you happen to be visiting Madrid on either November the 16th or December the 6th the entrance to the fascinating Sorolla museum is free. It is also free every Saturday afternoon after 2 p.m. and every Sunday. The Sorolla happens to be my favourite art museum in Madrid. The Sorolla museum is not just a collection of Joaquin Sorolla’s works, it is a museum of his life. As the museum is the house where he and his family lived in Madrid from 1911 until his death, it has a collection of sculptures, ceramics, jewelry, furniture and gives insight into his life with his family. Even if you go during the week, the entrance fee is very reasonable—only 3 Euros. If you are looking for more things you can do for free in Madrid, see What to do in Madrid for free—or almost free.